I am a speech therapist and special education teacher by training but really want to be a writer when I grow up. I have been collecting, writing, and fashioning stories forever. Over the years I had been a regular columnist in local periodicals and had several essays featured in newsletters and literary reviews. My children’s picture book, Famous Seaweed Soup was published in 1993. I hold an MFA in Creative Writing and Literature from Stony Brook/Southampton University (2016). My memoir. 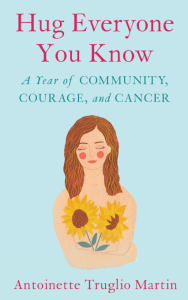 Hug Everyone You Know: a Year of Community, Courage, and Cancer, was released by She Writes Press on October 3, 2017. The story chronicles my first year with breast cancer treatment as a wimpy patient. It is everywhere books are sold including Amazon, Barnes and Noble, and Indie Bound. I live in my hometown of Sayville, New York with my husband, Matt, and am never far from My Everyone and the beaches I love.